The decision follows the release of a letter sent to Senate Judiciary Committee Chairman Chuck Grassley from attorneys representing Christine Blasey Ford, the woman who accused Kavanaugh of sexual assaulting her more than three decades ago when they were teenagers. In the letter, Ford's attorneys said an FBI investigation should be "the first step in addressing her allegations." Ford's attorneys argue that an investigation is necessary so that "the Committee is fully informed before conducting any hearing or making any decisions." Ford's attorneys also say that since she went public with her allegations, "she has been the target of vicious harassment and even death threats." 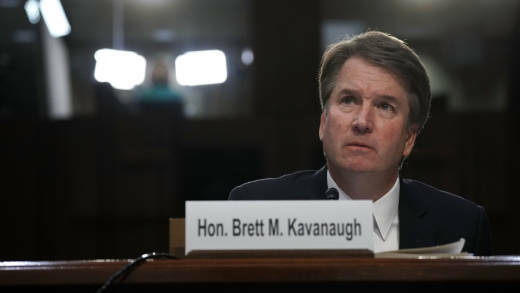 They also complained that the committee scheduled Ford to "testify at the same table as Judge Kavanaugh in front of two dozen U.S. Senators on national television to relive this traumatic and harrowing incident." Grassley declined Tuesday night to delay the hearing. "The invitation for Monday still stands," Grassley said in a statement. "Nothing the FBI or any other investigator does would have any bearing on what Dr. Ford tells the committee, so there is no reason for any further delay." Grassley's decision echoed the sentiment of Sen. Orrin Hatch, R-Utah, a former chairman of the Senate Judiciary Committee. "The FBI does not do investigations like this. The responsibility falls to us," Hatch tweeted. "We should proceed as planned." And retiring Sen. Bob Corker, R-Tenn., suggested that if Ford did not appear at Monday's hearing, Senate Republicans should proceed to move forward considering Kavanaugh's nomination. " If we don't hear from both sides on Monday, let's vote," Corker posted on Twitter late Tuesday night. Ford's attorneys stop short of saying Ford will refuse to appear before the committee, while objecting to the rushed timeline and comments from Republican senators who seemed to question her accusations. "The hearing was scheduled for six short days from today and would include interrogation by Senators who appear to have made up their minds that she is 'mistaken' and 'mixed up,' " the letter reads. "While no sexual assault survivor should be subjected to such an ordeal, Dr. Ford wants to cooperate with the Committee and with law enforcement officials." Democrats, including Senate Minority Leader Chuck Schumer, issued statements supporting Ford's concerns about the hearing. "I strongly support Dr. Ford's call for an FBI investigation before a hearing is held," Schumer said. "Dr. Ford's call for the FBI to investigate also demonstrates her confidence that when all the facts are examined by an impartial investigation, her account will be further corroborated and confirmed." California Sen. Dianne Feinstein, the top Democrat on the Judiciary Committee, also weighed in to support Ford. "We should honor Dr. Blasey Ford's wishes and delay this hearing," Feinstein said in a statement. "A proper investigation must be completed, witnesses interviewed, evidence reviewed and all sides spoken to. Only then should the chairman set a hearing date." Earlier in the day, Senate Majority Leader Mitch McConnell, R-Ky., said the Senate Judiciary Committee would offer Ford the opportunity to testify in either an open public session or behind closed doors about her allegation. "She could do it privately if she prefers, or publicly if she prefers," McConnell said, adding, "Monday is her opportunity." He stressed that Kavanaugh is eager to provide his testimony. Democratic aides have privately floated the possibility of boycotting the hearing if Republicans choose to proceed without Ford present. Grassley's committee staff has already begun conducting preliminary interviews by phone with alleged witnesses related to the incident that Ford described to the Washington Post as having happened in the early 1980s when she and Kavanaugh were teenagers living in the Washington, D.C., suburbs. Aides plan follow-up sessions as needed to obtain additional information ahead of Monday's planned public hearing. Ford named Mark Judge, a classmate of Kavanaugh's, as a witness to the incident at the high school party, but Judge told the Weekly Standard earlier this week he doesn't recall the episode. Grassley's office released a letter from Judge's attorney on Tuesday with a statement from him saying he has "no memory" of the incident. He also says, "I have no more information to offer the Committee and I do not wish to speak publicly regarding the incidents described in Dr. Ford's letter." Democrats have rejected the GOP process and are refusing to participate in any committee phone interviews. They are insisting that the hearing be delayed to further explore the allegations. They want additional witnesses beyond Kavanaugh and Ford to be added to the planned hearing Monday. But their primary demand is one that Ford asked for her in her letter Tuesday night — that the FBI conduct a full evaluation before any hearing is held. That's a proposal President Trump himself rejected earlier Tuesday prior to the release of the letter from Ford's attorneys. "That's not what they do," Trump said. "They have done now, supposedly, six background checks as Judge Kavanaugh has gone beautifully up a ladder." On Monday a spokesperson for the Justice Department indicated that the FBI does not get involved in matters unless a federal crime is alleged and that it had completed its work related to Kavanaugh's background check. Speaking at a joint news conference with Polish President Andrzej Sebastian Duda, Trump said Tuesday he feels "so badly" that Kavanaugh is going through the ordeal of the accusations. "I feel terribly for him, for his wife and for his beautiful young daughters," Trump said. "I feel terribly for them." Washington state Sen. Patty Murray, the No. 3 Democrat in the Senate, told reporters that an FBI investigation is necessary to ensure a full and impartial assessment of the accusations. "Scheduling a hearing for Monday, a week from when Dr. Ford made her accusations public, is a shameful attempt to jam this through without giving anyone the time they need to investigate and put together the questions that need to be asked," Murray said. "This is a test for the United States Senate on how we handle accusations of sexual harassment and assault." Murray and other Democrats are drawing a direct parallel between the claims against Kavanaugh and those raised in 1991 when Anita Hill accused Clarence Thomas of sexual harassment during his confirmation hearings for the Supreme Court. At the time an all-male Senate Judiciary Committee aggressively questioned Hill in televised hearings, cast doubt on her accusations and ultimately voted to move Thomas' nomination to the full Senate, which confirmed him to the court. That incident inspired a record number of women to run for federal office that cycle, including Murray, who was elected the following year. Murray told reporters that America — and women in particular — will be closely watching how Ford's case is handled. "If Republicans attack Dr. Ford and this turns into anything like what we saw in 1991, women across the country are going to rise up and make their voice heard and Republicans will pay a very huge price," Murray said. "I am here today to say, once again, women are watching, we are not going allow that to happen again." Before Ford asked for an FBI investigation, McConnell and other leaders said they wanted to hear directly from Ford but were standing firm on their expectation that she appear before the committee on Monday, blaming Democrats for creating a disorderly examination of Kavanaugh's record. "Next week Dr. Ford and Judge Kavanaugh will testify to the Senate Judiciary Committee under oath," McConnell said Tuesday. "We should not have gotten to this point. That this process has played out with so little order and so little sensitivity lies solely at the feet of Senate Democrats." Republicans have accused Feinstein of concealing details of Ford's accusation for several months after it was sent to her office in July. Feinstein referred the information to the FBI but did not discuss it until Ford went public over the weekend. She defended her decision to keep the letter private Tuesday, saying she was respecting Ford's own request for anonymity and following procedure for working with federal investigators. "What we were trying to do was get an investigation," Feinstein said. "We were going through all of that process." Some Republicans are warning that the Judiciary Committee has to tread lightly and handle the accusations with respect, regardless of their timing. Retiring Sen. Jeff Flake, R-Ariz., told reporters that there is a risk in being too aggressive or appearing to bully Ford. McConnell and other top GOP leaders repeatedly stressed that Ford deserved to be heard and they hoped she would agree to testify. Maine Sen. Susan Collins, who is one of just a handful of Republicans who have not said whether they plan to support Kavanaugh, proposed calling both Kavanaugh and Ford to testify and allowing their attorneys to question them both as witnesses. "I believe that would elicit the most information," Collins said.